Peter Lamphere on Rosemarie Jahoda: What Does It Take To Get Promoted to Principal in NYC? A UFT with guts would be picketing over the appointment of Jahoda as principal. And should contact the parents to protest. She is in the same vein of Monika Garg at CPEI -- a prototypical Farina rewarding people with a history of bad behavior and anti-unionism toward teachers and especially chapter leaders. Over at NYC Educator, Peter Lamphere, one of the key players in MORE, has some story to tell about his former vicious supervisor, Rosemarie Jahoda, recently appointed acting interim principal at Townsend Harris High School - one of the premier public high schools in Queens. Peter ended up with 2-U ratings under Jahoda and Bronx HS of Science principal Valerie Reidy. He fought one off successfully and had to hire a private lawyer for the other. The UFT "solution" was to parachute Peter out of the school, not to engage in a hand to hand combat with Reidy and Jahoda. Peter was the chapter leader and these two engaged in a direct assault on the union. Today, the UFT should be picketing Farina for this appointment. One of the roles MORE needs to play is in exposing these people and putting pressure on the UFT to take stronger stands. Jahoda is a criminal in my mind for destroying the careers of so many teachers and harming so many students in the process. With the MORE caucus this coming year, I plan to help run a series of chapter organizer training workshops, to help support educators mobilize the power of their coworkers to defend themselves against the insanities of our education system, and their abusive representatives. Please join us at tomorrow's forum about the nuts and bolts of chapter organizing, and share your own stories of organizing against abusive administrators below. Collectively, we can work toward building sanity into this system. Lamphere was among 20 out of 22 math teachers who filed a special complaint in 2008 against assistant principal Rosemarie Jahoda, alleging repeated harassment. They also charged that Reidy wrongly denied them tenure and gave arbitrary “U” ratings. An independent investigator found that the teachers were being harassed. I find it funny to be in a position of defending a system that I always thought was not a good one and desperately needed reform. At the beach yesterday we were hanging out with friends and some of their kids and their kids' friends. One of the young ladies is a 2nd year teacher in Brooklyn at a charter chain - she is a former Teach For America. Her first words to me were that she teaches in a charter school but wants to teach in a public school eventually. Why? 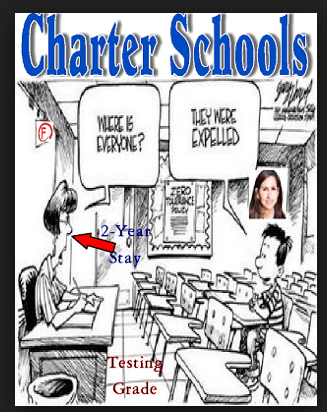 "Because the charter school model is not sustainable." Neither is TFA the felt. Here is the good, bad and ugly of our conversation. She said she likes the school, a grade 5-8 school. It is well-run and she feels they do not use harsh discipline measures. I mentioned KIPP and SLANT. She knew what I was talking about. In fact I think I have heard similar negative stories about her chain but not sure of my facts didn't challenge her. She teaches a non-testing subject so there is no pressure on her like people teaching tested subjects and she didn't think she could handle that kind of pressure. Her bosses say as much openly. Reading and math are all that count. She exhibits some of the TFA and ed deform propaganda. "Public schools do not serve black and brown students and charters do." She said that white students were well served by the public schools. Interesting pulling of the race card that I imagine charter school proponents are using in certain communities which eventually leads to the charge that opponents of charters are racist. I explained the basic lack of resource issue in public schools where charters, especially chains have enormous funding sources in addition to the public money they get - that I had taught for 30 years in a school of only black and brown students and felt that we had served a lot of them to the best of our ability. She asked me if I thought the school was well-managed. In some ways it was but the leadership was also narrowly obsessed by test scores and it was a top-down situation but that we had a very experienced staff that mostly knew what they were doing. I raised the issue of the disappearing kids from grade to grade - I asked if she sees classes from 5th-8th grade shrinking. She acknowledged that. I asked if the school back filled and she did not seem to think so. Meaning: The lowest performing students disappeared into the public schools. We were interrupted and I never got to tell her that our top students were "served" but now they are being lured out of public schools and into charters by the propaganda mill. That the ultimate goal is to extract the highest performing students and leave the rest in the resource-starved public schools. I find it funny to be in a position of defending a system that I always thought was not a good one and desperately needed reform. For decades before the ed deform attacks I fought that system and the UFT that supported it. So I have to temper any enthusiasm for what was and still is a corrupt public school system because what is being offered is so much worse. It is like the Trump-Hillary story. People feel forced to defend Hillary to stop Trump. She loves her job with caveats. Her chain has a path to a Masters degree program - maybe with some financial support - an important way to retain teachers - another major charter advantage. So what's not to like? Why does she want to end up teaching in a public school? The much longer hours and time commitments - her $15000 higher salary to a public school starting salary is really to cover some of those extra hours. Both public and charter teachers still have to put in a lot of extra time in addition to the salary but with a longer day, charter school teacher days are even longer. "I am very tired at the end of the day," she said. "The charter model is not sustainable." She loves teaching but even with a weak union over the long run she prefers a job with some protections even it means working in the NYCDOE. The number of teachers whose tenure prospects were deferred fell slightly to 34 percent, down from a high of 44 percent in Bloomberg’s final year. Under both administrations, rejection rates have hovered around 2 percent…. Do we know for what percent of teachers tenure is postponed until the fifth or sixth year? I assume UFT should have that number - but maybe they don't care enough to track it. Leonie sent this link to a Chalkbeat piece on tenure numbers that does fill in some blanks. New York City teachers were more likely to earn tenure last school year than at any point in the previous five years, but approval rates remain far lower than they were just a few years ago, when virtually every eligible teacher won the job protection. Sixty-four percent of the 5,832 eligible teachers were granted tenure during the 2014-15 school year, up from 60 percent the year before, according to data released Thursday to Chalkbeat. Another 34 percent had their decisions deferred, and 2.3 percent were rejected, effectively ending their teaching careers in the district. The numbers show that eligible teachers are slightly more likely to receive tenure under Mayor Bill de Blasio’s watch. But they also show that the de Blasio administration has not reversed the approach of his predecessor Michael Bloomberg, whose administration made attaining tenure dramatically more difficult not by rejecting tenure applications, but by delaying a larger share of those decisions to a later year. Under Bloomberg, who promised to move toward “ending tenure as we know it,” tenure approval rates plummeted from 89 percent in the 2009-10 school year to 53 percent the year before de Blasio took control of the city school system. Bloomberg argued that too many teachers were earning tenure too quickly, and the city began delaying decisions for a large portion of eligible teachers. Over his first two years, de Blasio has slowly changed course. In his first year, tenure rates inched up to 60 percent, a 7 percent increase that de Blasio said reflected his administration’s interest in rewarding and retaining top teachers. And last year, the approval rate increased again to 64 percent. A key feature of the national debate is how long teachers should be in the classroom before being considered for the job protection. U.S. Secretary of Education John King recently waded into that conversation, saying that two years is not enough. Under a recent change to state rules, teachers can be considered for the job protection only after four ‘probationary’ years. Meanwhile, New York City school leaders are already making the next round of tenure decisions. Most of this year’s recommendations were due from principals April 30; teachers should be notified of those decisions by late June. My last column in The Wave on La Cage... I promise. The love between the cast members goes on though, with some people saying this was one of the greatest experiences of their lives. Last Sunday night when I left the post matinee cast party thrown by the incredibly gracious Susanne Riggs and her husband John many members of the cast of La Cage Aux Folles were still frolicking in the pool. It was almost 9:30 and the non-locals, of whom there are many, still had a long trip home, some up to 2 hours. Many of them had arrived up to 2-3 hours before the 2PM show began to get their extensive make-up and hair done and do all the other essentials in the hours before the show goes on, thus spending 10 hours or more in each others’ company. Oy! You might say, but not to this crew. So here are a group of performers and support people who make the show work from behind the scenes, many of whom had not met before the show began rehearsals almost 3 months ago seeming to not get enough of each other. Apparently bonding that makes super glue look weak has taken place. 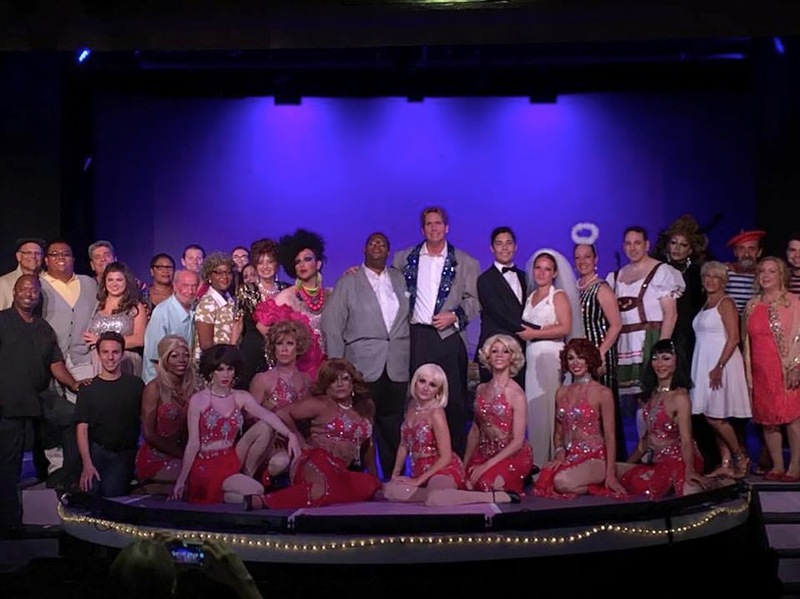 The cast and crew of La Cage Aux Folles, which is heading into its final sold-out weekend, are having a magnificent time. Some of the newcomers to the Rockaway Theatre Company say this has been the best experience of their performing careers – the support of the production team and their fellow performers has been taken to new heights. The evening shows end around 11PM and people are still mulling around an hour later, with whole batches going out to a diner after the show. I believe it is not only the opportunities to perform that attract so much high end talent to the far away reaches of the RTC at Fort Tilden but also the support and a bonding where life long friends are made and even some romances – if I tell you about those I have to kill you. At every show members of the growing RTC alumni show up to see their colleagues perform and they are the very best of audience members, hooting and hollering and cheering everyone on. As an ensemble member I get to sit on the stage at 3 different points in the play and get to surreptitiously observe audience reactions. Even these RTC vets were blown away by Chazmond Peacock’s performance as Albin and raved about the antics of Matt Smilardi as Jacob. The other night the front two rows were filled with teenagers who have been part of the RTC but are not in this show and they were so excited at what they were seeing, especially when the Cagelles, of mixed men and woman, all dressed up as women, were dancing. They were also there to cheer their friends from the Young People’s RTC Workshops: Their amazing choreographer and dancer, Gabrielle Mangano, one of the Cagelles and herself a former teen RTCer, and a Kacie Reilly, recent grad of the young people’s workshop and one of the most elegant young dancers I’ve seen on stage. And of course the delightful Dante Rei (you’ll recognize him as his injuries in the show mount) who has aged out of his teen years into manhood so quickly but has not lost that sense of play he always brings to any show he is in. Then there is quadruple threat (musician, singer, dancer, actress) Leigh Dillon (Anne), a soon to be senior in high school, who graduates to the main stage big time in this romantic grown-up role. Her fiancé, Jean-Michel, is played by the Dorian Gray-like Frank Caiati (now 30), who apparently has a portrait of himself hanging somewhere that is aging. Frank has been a driving force at the RTC since his teen years. When Anne and Jean-Michel in the show smooched it up, the giggling from the front rows couldn’t be contained. Seeing these wonderful kids, the future main stagers at the RTC who will be the Manganos and Caiatis of the future, being so into the theater is as exciting as anything the RTC has managed to accomplish. Norm blogs at ednotesonline.org when he is not staggering out of cast parties. Some of you may think this is about Bernie but this article is about the Jeremy Corbyn takeover of the Labour Party in England. Corbyn can make Bernie look like a right winger. Will be see the day where Bernie or his surrogate(s) take over the Democratic Party? I think not, but let's explore what is happening in England with what the anti-left Economist terms the left takeover of one of the major parties in England. Which raises some interesting contrasts with the Trump temporary takeover of the Republican Party, which follows the Tea Party takeover of a segment of the party. it leaves Labour’s moderates—who remain a large minority of the membership and dominate the parliamentary party—with a grim dilemma. Some are toying with declaring independence from Mr Corbyn and sitting as a separate parliamentary group. One can read "Labour's moderates" as our Republican moderates - are there any out there? An interesting point if viewing Corbyn as a Trump-like takeover of the party instead of Bernie. Oh the complexities in these stories. The left Labour Party is undergoing the stresses the right Republican Party is going through while the Tories are facing threats from the right wing nationalist parties. The wild card is the Dem Party here --- Hillary wins and I don't see it moving left but remaining center as Hillary begins her 2020 re-election run the day after the election - unless the left becomes a massive force to force change. Remember -- there are some apt comparisons between the parties in the 90s under Tony Blair and Bill Clinton, followed by Obama - both moved to center right triangulation with neo-liberalism at their core --- for we educators, both these leaders initiated the attacks on public ed and teachers and their unions - and also joined in with the assault on labor, even when they sat on the sidelines (see Obama and Wisconsin). Look at the last 24 years, 16 of them under Democrats -- unions took major hits that are leading to their having less and less influence. But I fear the Bernie moment may have passed, as we see more articles about how the liberals/progressives are disturbed by Hillary who sure she has secured her flank on the left, has shifted to wooing Republicans, who must be assured that Hillary's move "left" is being done with a wink. Maureen Dowd with a surprising column about Hillary, The Perfect G.O.P. Nominee. And then there is the role the Socialist Workers Party (SWP) in England is playing in the Labour Party takeover. British SWP was once closely aligned with the American International Socialist Organization (ISO) which has played a prominent and leadership role in the UFT opposition within MORE - a complex internal relationship that deserves a separate commentary. As you read this piece do not forget this The Economist is a vicious anti-left publication and this is a biased article. If you were reading something like this in The Guardian there would be a different slant. ON A sunny afternoon in the garden of the Bristol Flyer pub, a gang of Jeremy Corbyn fans are gathered around a table discussing the Labour Party leader’s rally in the city the day before. “Three thousand people? Was that it?” asks one. “Yeah, you think Corbyn and you think 500,000!” replies a man in a Ramones T-shirt. Still, on to the next battle. Leaflets are circulated, which cheer on Labour’s leader and attack Tories and Blairites. Yet these Corbynistas are not Labour supporters. They are members of a rival outfit: the tiny Socialist Party. Since he won Labour’s leadership contest last September, Mr Corbyn and his once tiny band of allies on the party’s hard left have taken control of Labour. Partly this is the product of an effort by gnarled agitators from outside it to flood the party with activists and challenge the moderates in its institutions. But it is also thanks to a mostly unorchestrated surge of previously disillusioned new members, many of them young, into the party. A new leadership contest, triggered after a vote of no confidence in Mr Corbyn by moderate MPs in June, illustrates the transformation. Mr Corbyn deserves to flop. In the past 11 months Labour has lost seats in local elections, failed to hold the government to account, become infected with anti-Semitism, tumbled in the polls and, thanks to its lacklustre campaign to Remain, contributed to Britain’s vote for Brexit. Following the referendum, most of Mr Corbyn’s shadow cabinet resigned. Despite all this, he is heading for a solid win in the leadership contest over Owen Smith, the moderates’ actually-quite-left-wing candidate, on September 24th. This week a court ruled that the 130,000 Labour members who have signed up since January should be allowed to vote in the contest, making Mr Corbyn’s victory all but certain. How did the formidable centrist party of Tony Blair end up in the hands of Mr Corbyn, an admirer of Hugo Chávez? Entryism has played a part. Mr Corbyn’s victory brought back veterans of Labour’s battles in the 1980s, when Militant, a Marxist group, tried to take over the party. One trouper of the hard left, Jon Lansman, now runs Momentum, a powerful Corbynite movement. Its local groups have come to dominate many local Labour branches and chivvy MPs to support Mr Corbyn. On August 10th Tom Watson, Labour’s deputy leader, alleged that the party was being infiltrated by Trotskyists from groups like the Socialist Party (whose website boasts of its members addressing Momentum events). Some in Momentum want to reinstate “mandatory reselection”, enabling local members to boot out sitting Labour MPs. The takeover is mirrored at the national level. The National Policy Forum, a policymaking body created by Mr Blair, has been sidelined in favour of the National Executive Committee (NEC), which has tilted left; at elections on August 8th all six of the seats reserved for constituency representatives went to Corbynistas, who now fill 16 of its 33 places. A document circulated by Mr Lansman in December (titled “Taking control of the party”) proposed giving the NEC a veto on candidate selections. If he is re-elected, Mr Corbyn is expected to purge the party’s headquarters, dumping Iain McNicol, its moderate general secretary. Yet Labour’s transformation owes as much to circumstance as conspiracy. The conditions for Mr Corbyn’s victory were ripe: years of austerity concentrated on the young, an outgoing leader (Ed Miliband) whose compromises with electability had failed to save Labour from electoral disappointment and, crucially, new rules enabling non-members to vote in the leadership contest for £3 ($4). 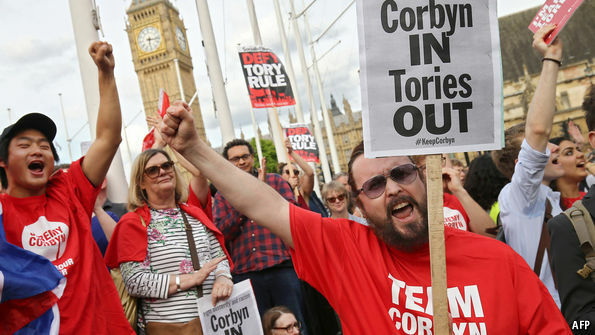 Idealistic lefties poured in, tripling the party’s electorate and propelling Mr Corbyn, initially a no-hoper, to a crushing victory. Some of the new joiners are former members who quit during the Blair years. Others are young folk with no experience of party politics. But only a minority, albeit a well organised one, are entryists. Most are simply attracted to the man’s unvarnished style and uncompromising politics. 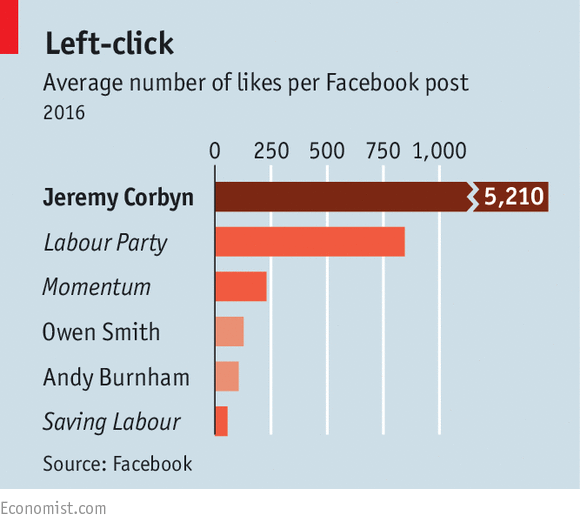 That is evident on his Facebook page (which has more “likes” than that of Labour itself) and at his rallies. In Bristol speakers excoriated Thangam Debbonaire, a local Labour MP who had criticised Mr Corbyn, to cries of “Deselect!” from the crowd. This points to a hard truth for Labour moderates: the party’s metamorphosis is as much a bottom-up swell of enthusiasm as a takeover at the top. Without “the movement”, the top-down changes would be unthinkable. The mass of new members protects Mr Corbyn and forces those who want to make their way in the party to bow to him: of three Labour mayoral candidates selected on August 9th and 10th, one (Steve Rotheram, the unexpected winner in Liverpool) is a Corbyn ally and another (Andy Burnham in Manchester) is a moderate who has pandered to Corbynistas. As long as he has this large, growing base Mr Corbyn can face down his MPs and continue remaking the party for as long as it pleases him. This is excellent news for the Tories, who are contemplating calling an early election to cash in their poll lead (14 points, according to the latest YouGov survey). And it leaves Labour’s moderates—who remain a large minority of the membership and dominate the parliamentary party—with a grim dilemma. Some are toying with declaring independence from Mr Corbyn and sitting as a separate parliamentary group. But Labour is a tribal party and most MPs are inclined to dig in. They are in for a long wait. Michael Fiorillo sent this follow-up piece on the poor white working class. from the American Conservative. Michael who is left gets credit for his wide-ranging reading. Vance grew up poor white and ended up at Yale law school after serving in the marines. This is the follow-up interview where so many interesting points about both white and black poor are made. The Trump appeal he points out while including elements of racism, not in the least bit inspired by the fact that the white poor are often totally ignored, also touches on some things that resonate. Like the arrogance and condescension of liberals and people on the left. I actually saw an example of that at the MORE retreat yesterday. And this article reminds me of Mike Schirtzer who entered MORE 4 years ago with a white working class mentality and how some people rolled their eyes. Mike has gotten to see a lot of angles he was not aware of before but he also has maintained his gut level white working class instincts. While I never viewed myself as coming from white working class roots - both my parents were ILGWU garment workers - but Jews never seem to feel they would get stuck and not be able to rise out like the despair described in these articles. An interesting thought on my part: Is it ever possible to unite the black and white poor? Maybe an FDR type but we always seem to need a massive crisis. Obama looked to be a possibility but as a neo-liberal and also being black made that impossible. He talked FDR but was more Regan.